The 34 metre motor yacht Angelee, listed for sale by Will Noftsinger at Denison Yachting, has been sold in an in-house deal with the buyer introduced by Jarrett Hiebert. Built in GRP by Argentinian yard Tarrab, Angelee was delivered in 1995 with a refit in 2018 including a full exterior repaint. A spacious interior in high gloss maple wood panelling accommodates 10 guests in five cabins comprising a master suite, VIP suite and three twins, all with entertainment centres and marble en suite bathroom facilities. The saloon is panelled in light woods and is furnished with custom sofas, coffee tables, a granite-topped bar and a full entertainment centre including a large television screen. Forward is a dining room with seating for 10 guests along with a credenza storing all china, crystal and silverware. Further forward still is a fully equipped galley including a U-shaped dinette for sociable informal snacks. The aft deck has a large al fresco entertainment area and port and starboard stairs down to the swim platform while more outdoor relaxation is available on the flybridge, offering a U-shaped bar, bar stools, a large rectangular table and ample seating. Walk around decks lead to the bow area boasting an oval hot tub surrounded by three large sun pads. 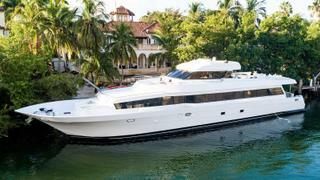 Her top speed is 21 knots and her power comes from two 1,450hp Detroit Diesel 16V92TA engines.